You know that feeling after you finish a big quilt, the kind that takes hours and hours of piecing? The one that you fuss over deciding how to quilt and then causes that ache in your shoulders as you accomplish it.... and then a few nights sitting in front of the t.v. stitching the binding? So this quilt ain't that, but amazingly, the feeling isn't all that different. So why IS there a very similar sense of accomplishment and relief at a quilt that measures just 11" x 11" square and was sewn up in a week's time? It's a mystery for sure, definitely without the shoulder ache, but nonetheless true this time for this quilt. 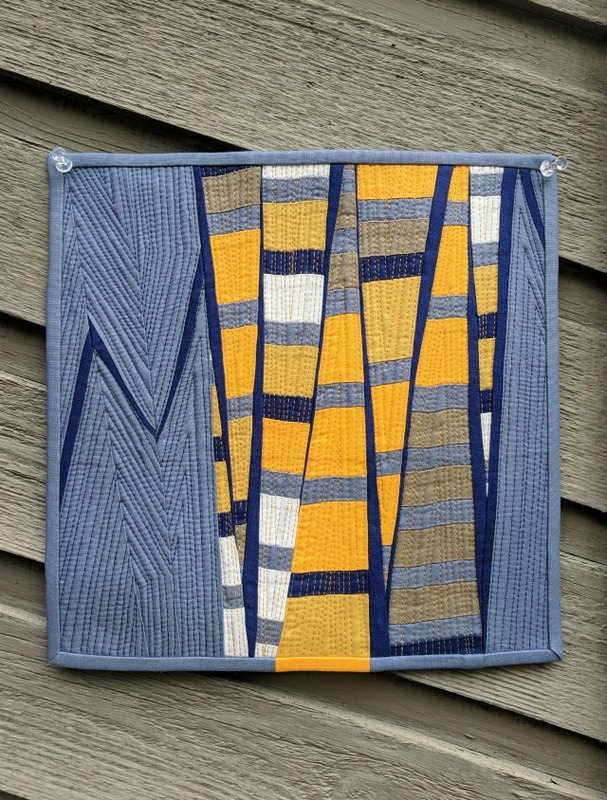 This mini was created for Curated Quilts' Improv Mini-Quilt Challenge, where the theme was "Connections" and called for the use of any or all of the following: cream, yellow, mustard yellow, navy, moss green, grey. I chose to include them all. 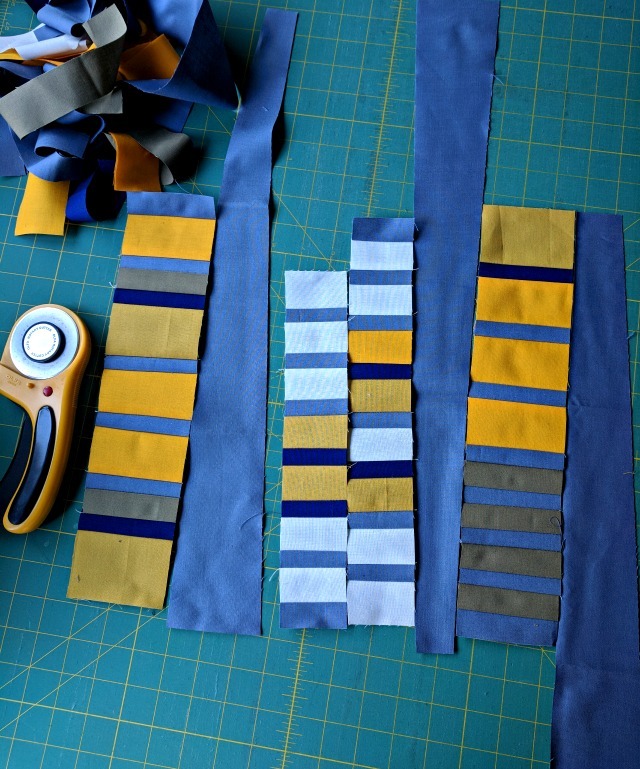 It was totally one of those where I didn't know where I was going at the outset, but just started cutting and sewing. In fact, I had no clear view where it was headed until I was well into the process, and even then I wasn't sure of its success. But a little time and rearranging was all it took, and once I committed to it, I was excited to jump in on the quilting, and it didn't disappoint. I knew right off I wanted to accent those triangles, and I did so somewhat organically (my favorite!) 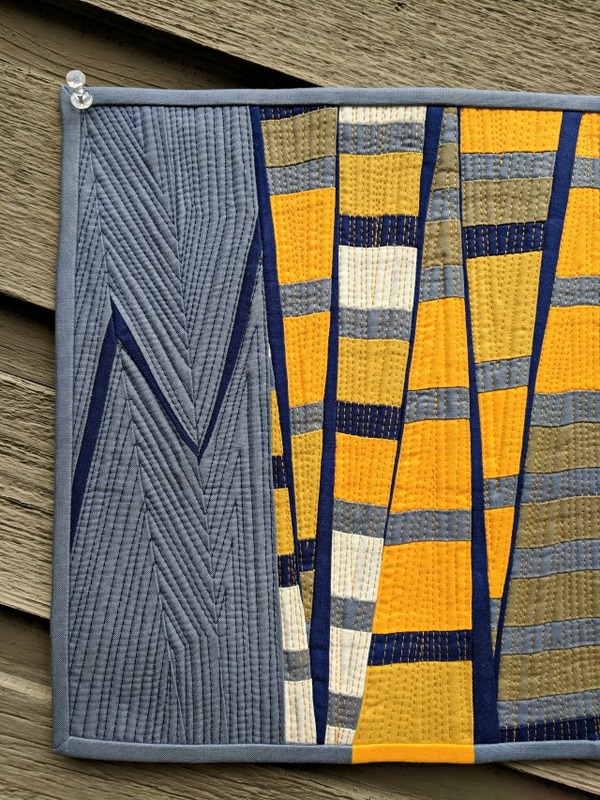 in Aurifil 50wt #2140 (Mustard). 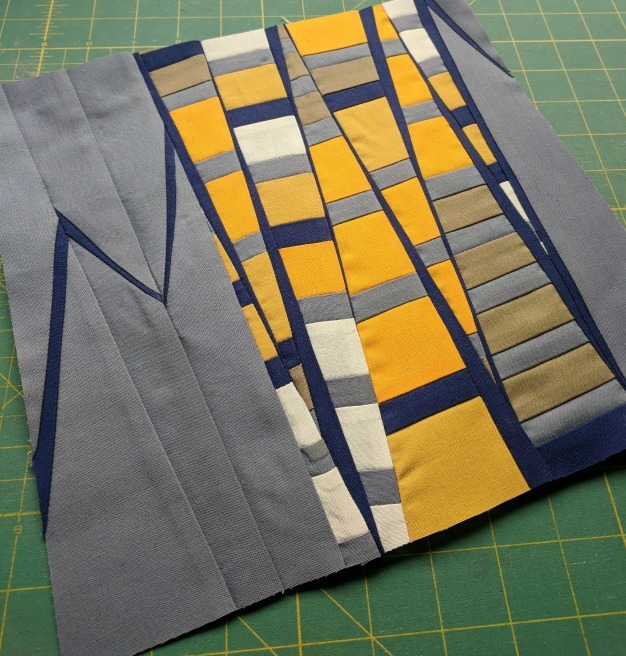 It was a little more trepidatious as I started in quilting the gray with #2784 (Dark Navy). But the farther I went, the more I loved the movement it added. When it came to finishing it off, I chose micro-binding cut at 1 3/4", with just a tiny accent of matched binding. So seriously, this is my favorite kind of creating. I love the big quilt-on-every-bed thing, I really do. But the impulsiveness of this kind of small project just really gets my creative juices flowing. There's an eagerness that other projects don't necessarily provide. It's hard to explain, but it's palpable. So there you go. 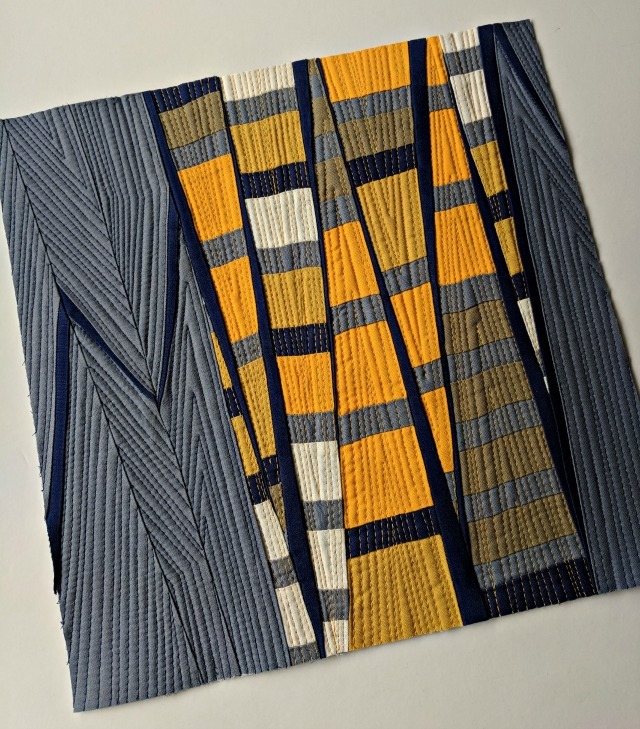 I'm calling it "Loosely Connected" because of the slim bonds of navy holding the piece together. What I didn't really intend to be the main focus became just that. 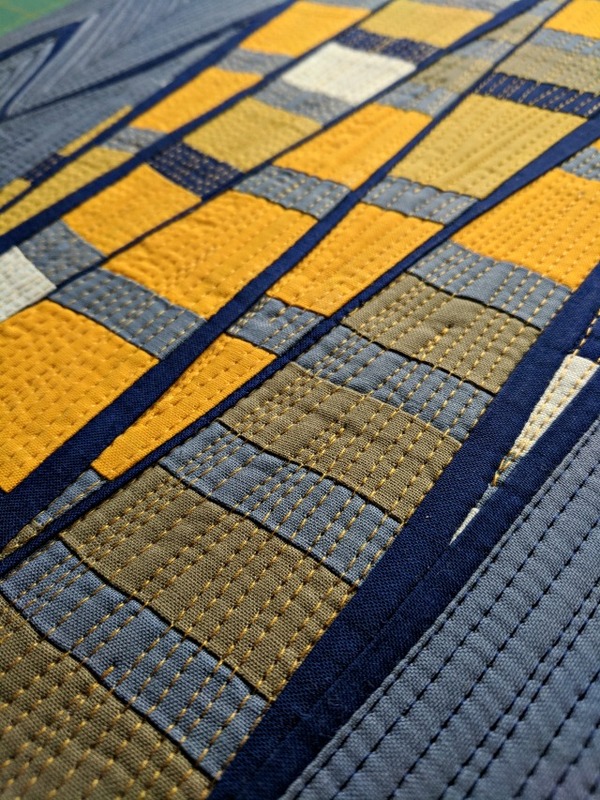 Linking up with Curated Quilts Improv Mini Quilt Challenge. Just fabulous! The pop of yellow in the binding is a nice touch. I love that you showed how the quilt evolved and the difference between the pieced top and finished quilt is stunning. 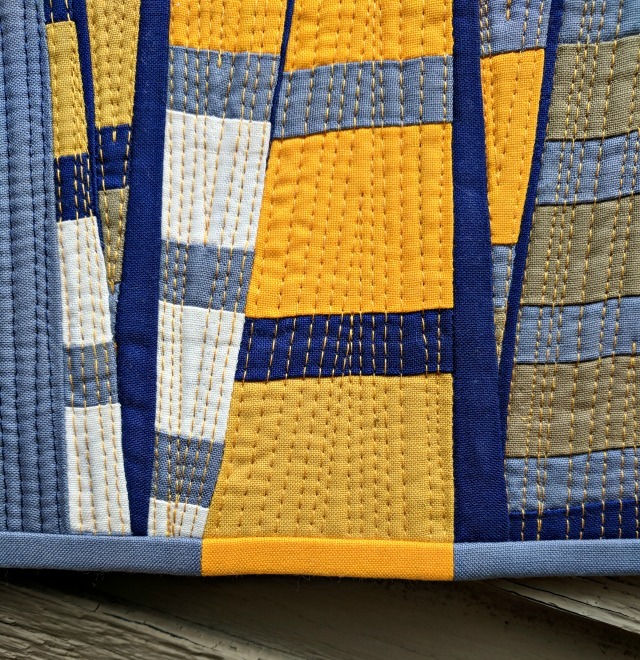 The quilting adds such a great design element and the accent of matched binding is well done! Another home run, Debbie! Doesn't that feel great? Fun process too, thanks for sharing! Love, love, love!! Fabulous end product for not knowing where you were going when you started. Somehow, you always make it work. I love this. Superb! Definitely fits the challenge. Its just wonderful. The spark of yellow in the border is terrific. Hopefully back to normal soon! It is really wonderful! Your quilting really just takes it over the top. Does your guild have a show where you all display the challenge? It is fun to work on small art pieces just because. I'm working on mine - I love what you did with yours! 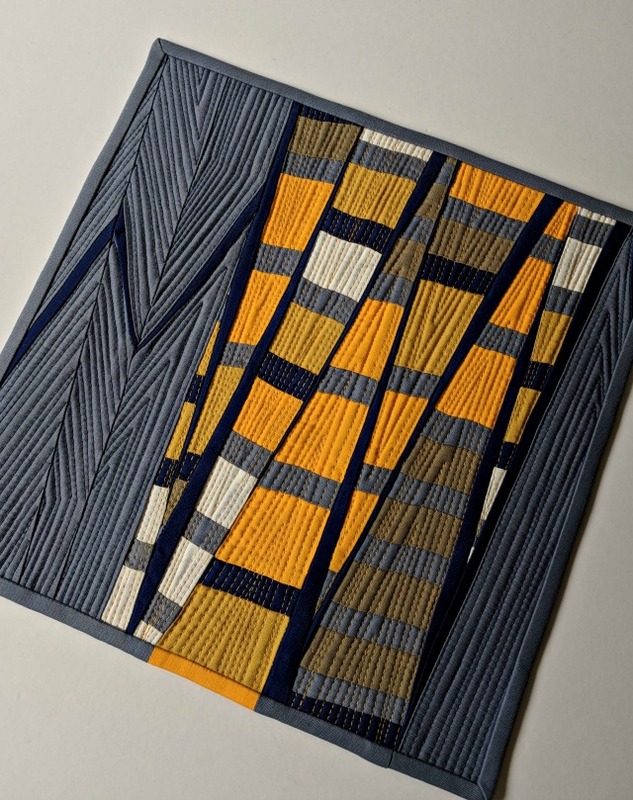 Wow I love the design and how you made the colors work so well--especially that short binding piece in yellow to carry out that section! Amazing!! That little bit of yellow in the binding is perfecto! Love the fact that you just jump in and make . . . and finish. Would you send some of your motivation my way? This is just beautiful Debbie! I love the navy “connections” and that little pop of yellow is just perfect! Beautiful! I love how you showed the quilt top and then the finished quilt, what an impact the quilting made, it looks like a different piece. I don't know how you come up with these ideas but you have an amazing talent and gift. This mini quilt is perfect. Thank you for sharing the steps you took to create Loosely Connected. Very Nice. Your talent just seems to grow!